Over the past decade, the IT department in organizations has evolved from serving a supporting role to handling a more strategic role. This paradigm shift is bringing with it a sea of challenges for the CIOs, effectively changing their jobs in profound ways. Businesses across the spectrum realize the importance of digital technology to their business strategy today. More and more businesses are undertaking digital transformation projects with the objective of achieving a competitive edge over the competition. IDC forecasts that worldwide spending on digital transformation projects will cross $1.3 trillion in 2018. By 2021, the same number is expected to reach $2.1 trillion. It would be an understatement to say that the stakes are high. At the helm of these changes are the CIOs whose jobs are getting more complex by the minute. Besides acquiring the essential IT hardware and hiring the suitable talent for supporting the other departments and “keeping the lights running”, today’s CIOs have a dizzying array of new responsibilities. They have a central role to play in future-proofing their organizations from rude shocks originating from disruptive technologies in their respective industries. That means being more updated and aware of their industry and the emerging trends in it, a role that was traditionally the domain of CEOs and CMOs. Here’s how CIOs will continue to play a more proactive and profoundly influential role in shaping the future of their company. Digital technology is revolutionizing every aspect of business processes, including operations, marketing, sales, customer service, and HR, among many others. The market is replete with cutting-edge digital tools that enhance the capabilities of various departments and offer invaluable insights for them to achieve substantial efficiencies, improve the product, and deliver superior customer satisfaction. In the light of this, the IT department is no longer the only source of IT solutions for the other departments and their employees. Indeed, in most organizations, there exists an alternate realm of IT hardware and software that is not supported by the IT department at all. IT professionals begrudgingly call it Shadow IT. The existence of shadow IT should be less of a concern for the CIOs. Shadow IT, despite the name, is not “the dark side”. In fact, it opens up tremendous opportunities for the CIOs. It establishes the fact that there are cost-effective, easy to use, and robust digital tools in the market that can replace most of the IT support functions in the organizations effectively. The CIOs are not free to pursue digital transformation projects that go beyond just support functions. They can focus more of their efforts on selecting and implementing technologies that help their organizations achieve a competitive advantage in the industry. By embracing and successfully leveraging the shadow IT, CIOs can graduate from their role of a Chief Information Officer to that of a Chief Innovation Officer and play a more vital role in their organization’s growth story. On the one side, CIOs should be mindful not to chase every new buzzword-laden emerging technology, before ascertaining its potential and actual benefit to the organization thoroughly. On the flip side, they cannot afford to miss a technological revolution, lest they want to risk their business getting disrupted by an emerging startup in another corner of the world. That means not dismissing a technology because of the hype. In fact, in the recent MIT Sloan CIO Symposium, senior IT executives from some of the leading businesses discussed how the hype and noise around AI should not result in CIOs dismissing it as a technology with immense benefits. Erik Brynjolfsson, Director of MIT’s initiative on the digital economy, stressed on the fact that AI technologies have surpassed human capabilities in image recognition. He also shared that some categories of AI can perform specific tasks substantially better than humans while lagging behind on others. Therefore, it is imperative for the CIOs to assess the potential of each technology to their specific cases of application and then decide whether it’s suitable for them or not. 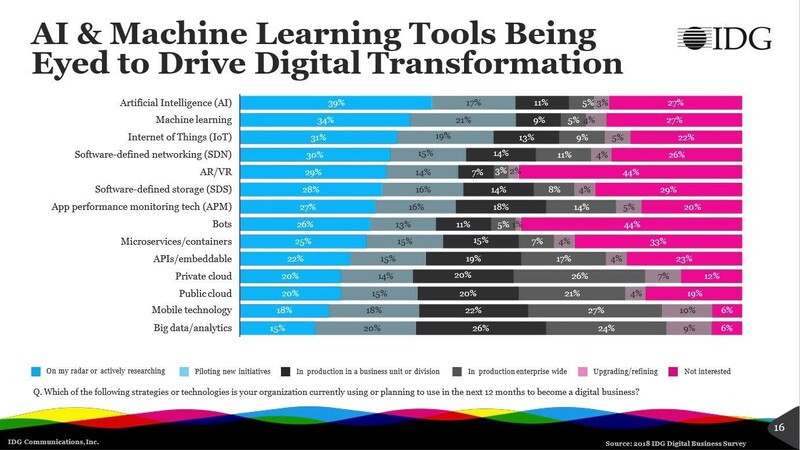 As per IDG’s 2018 State of Digital Business Transformation, 73% of the businesses are in various stages of adopting AI as per their digital transformation efforts. There is no escaping the fact that advancements in AI technology will inevitably result in millions of job losses. With the reduction in the human element, businesses might be hopeful of achieving enhancements in efficiencies by the magnitudes. After all, hiring and managing people continues to be one of the most challenging aspects of running businesses. Only 2% of Americans move across the state borders for any reason. 6 million people are jobless in an economy with 6 million open jobs. Clearly, there is a mismatch of skills. So, with automation taking charge of all low-level tasks, managers are right to anticipate substantial improvements in efficiencies. While that might be true to some extent, it can also mean hiring specialized talent to complement the organization’s automation policies and approach. For CIOs, this means that they are not only tasked with undertaking the adoption of revolutionary automation and AI technologies, but also hiring the right talent for supporting those initiatives. With specialized AI talent in short supply, organizations that create a robust HR strategy to court, attract, educate, train, and retain quality talent, even from remote locations, can achieve the early mover advantages. One of the possible things that CIOs might look into for realizing this goal is remote or mobile workforce supported by an advanced enterprise mobility management policy. Steven Zerby, CIO, Owens Corning strongly asserts that CIOs must groom the potential candidates for the roles of the next generation leaders. At Agero, potential candidates are designated as leaders who are ready now, ready in 12-24 months, and those who have leadership potential after 2 years. The roles and responsibilities of CIOs are too important for their succession plan to be a last minute discussion. CIOs must proactively train and refine the skills of potential candidates and groom them for the leadership positions. Most importantly, CIOs must ensure that their potential successors have the capabilities to be at the helm of the affairs. IT heads do not maintain servers, write codes, or perform other technical tasks. Their role is more strategic in nature. Anyone who is taking charge of the position must display a strong strategic vision, financial acumen, deep industry knowledge, and awareness of their department’s role in realizing the organization’s stated objectives. It is the responsibility of the CIOs to ensure that their successors demonstrate these capabilities. CIOs roles are changing rapidly. They must get used to it. Their roles and responsibilities are a function of their organization and its industry. Depending on these factors, some CIOs often lead HR activities like hiring, training, and skills enhancement initiatives. In some organizations, they lead the R&D projects, while in other cases, they supervise customer support teams. 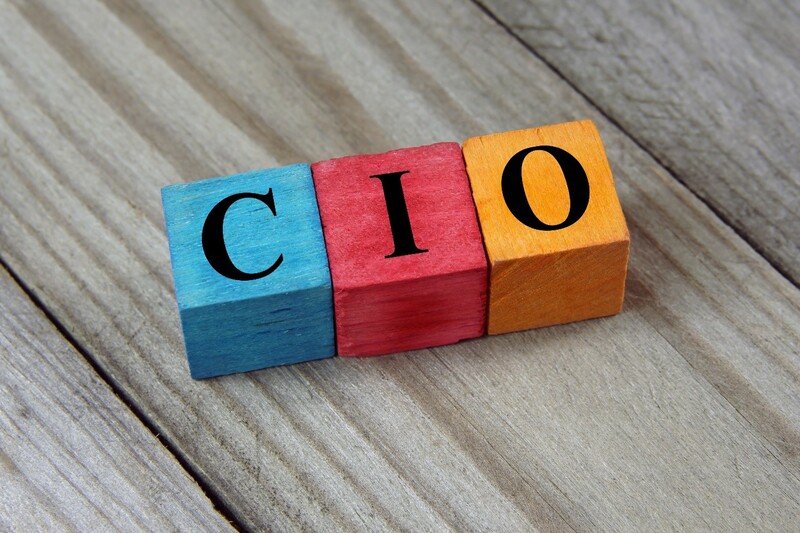 CIOs must continuously redefine their roles and responsibilities to adapt to the changes within their organization and its environment in a way that prepares their organization for the challenges of the future. The only thing is that there’s no handbook for how to do this. Then again, that’s precisely what differentiates the leaders from the rest.